The iPad is an exciting device for viewing Internet and network-hosted HTML-based content. Now, using the power of Mac OS X automation and your Mac, it's easy to create powerful web-applications, designed to present photos, text, audio, and video, in full-screen 1024 x 768 pixel views that can be seen and enjoyed on iPads and computers. The services described on this page, turn text copied to the clipboard into a scrolling single-page iPad web-app, optionally containing an image, audio, or video file. Click the thumbnail images in the righthand column on this page, to view examples of some of the various page design options. To learn more about Services in Mac OS X, click here. 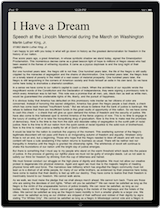 Creating text-based content specifically for the iPad is as easy as copying text in any application to the clipboard, and then choosing the “Create Single-Page Web-App with Clipboard Text” service from the Services menu. 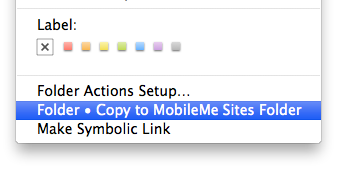 Once selected, a dialog will be presented from which you choose the options for the design of your web-application. You make your design selections, choose any related image, audio, or video file, and click the Continue button to have a new web-app placed on the desktop. Place the web-app folder on your iDisk or other server, and then view the app from the Safari browser on the iPad! Title, Subhead, and Attributions - In these four text fields (1), enter the title of the application, the subhead, and any author-copyright information. This data will be appended to the beginning of the story text passed from the previous action. Optional Media - Optionally, the web-app can contain a duplicate of either an image, audio, or movie file added using the popup menu (2). Note that chosen images will be scaled to a maximum width of 720 pixels, and any chosen audio file will be converted to MPEG (ACC) format if the source file is an AIFF, WAV, or SDII file. Chosen movie files are assuemed to be in the correct H.264 used by the iPad and will not be re-processed automatically. The position of the media inserted into the story, is indicated by the selection in the location popup menu. Optional Media Caption - Optionally, you can include a coption, displayed with the inserted media, by entering the caption text in the caption text field (3). For added images, you have the option to use the caption data embedded in the IPTC description (caption) tag of the image file, by checking the “Use embedded metadata for caption” checkbox. 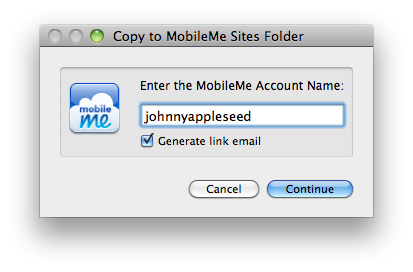 NOTE: to NOT iclude a coption with the inserted media, leave the caption text field blank, and the checkbox unchecked. Application Metadata - Optionally, the web-application can contain a description and keywords that can be indexed by internet search engines. Enter a short description of the application in the description field, and a comma-delimited keyword list in the keywords text field (4). Text Styles - You can set the font familiy, size, color, and letter-spacing individually for each of the application text elements (5). The popup list of typefaces contains only those fonts installed on the iPad. 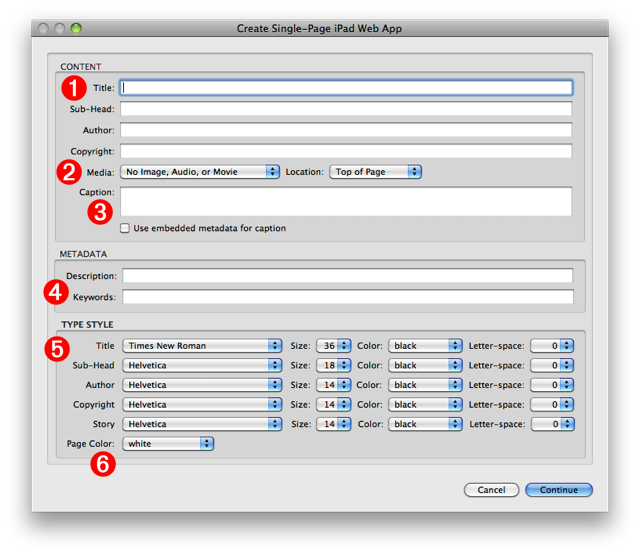 Page Color - The background color of the applicaion page can be chosen from the popup menu (6). Here is a sample of some of the page background colors. Download the installer for the action and services. An example of a simple single-page of scrolling text. 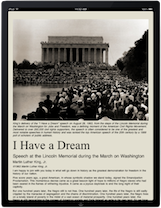 An example a scrolling text page containing an image. 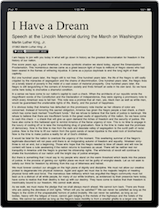 An example a scrolling text page containing an audio clip. 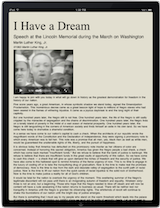 An example a scrolling text page containing a video clip.